The necessity for pathogen recognition of viral infection by the innate immune system in initiating early innate and adaptive host defenses is well documented. However, little is known about the role these receptors play in the maintenance of adaptive immune responses and their contribution to resolution of persistent viral infections. In this study, we demonstrate a nonredundant functional requirement for both nucleic acid-sensing TLRs and RIG-I–like receptors in the control of a mouse model of chronic viral infection. Whereas the RIG-I–like receptor pathway was important for production of type I IFNs and optimal CD8+ T cell responses, nucleic acid-sensing TLRs were largely dispensable. In contrast, optimal anti-viral Ab responses required intact signaling through nucleic acid-sensing TLRs, and the absence of this pathway correlated with less virus-specific Ab and deficient long-term virus control of a chronic infection. Surprisingly, absence of the TLR pathway had only modest effects on Ab production in an acute infection with a closely related virus strain, suggesting that persistent TLR stimulation may be necessary for optimal Ab responses in a chronic infection. These results indicate that innate virus recognition pathways may play critical roles in the outcome of chronic viral infections through distinct mechanisms. Chronic viral infections such as those caused by HIV and hepatitis B and C viruses are a major global health problem with millions infected worldwide (1). The mechanisms of immune-mediated control of chronic viral infections in humans or mouse models have been well studied and are multifaceted. Virus-specific CD8+ T cells are important for elimination of virally infected cells and gradually lose effector function throughout the course of infection (2–4). In addition, exhausted CD8+ T cells express multiple inhibitory receptors, which further limit their function (5–9). In addition to CD8+ T cells, CD4+ T cells also play an important role through both help to CD8+ T cells and to B cells for Ab responses, which contribute to virus control (4, 10–15). Despite this depth of understanding regarding adaptive immune mechanisms of virus control, little is known regarding the role of innate immune recognition of virus during the control of chronic viral infections and how innate immune activation may influence pathogenesis. The innate immune system senses virus infection primarily, but not exclusively, through the recognition of viral nucleic acid. The main pattern recognition receptors involved in sensing of viral nucleic acid include RIG-I–like receptors (RLRs), expressed by most cells, and TLRs, which are expressed primarily by macrophages, dendritic cells (DCs), and also B cells (16–18). The RLRs RIG-I and MDA5 detect cytosolic viral RNA replication intermediates and signal through the adapter MAVS (IPS-1/VISA/Cardif) to initiate the production of type I IFNs and other inflammatory cytokines, whereas the nucleic acid-sensing TLRs, TLR3 (dsRNA), TLR7 (ssRNA), and TLR9 (DNA) rely on the adapters MyD88 and Toll/IL-1 receptor domain-containing adaptor inducing IFN-β and localize to endosomes in an UNC93B-dependent manner. Signaling is abrogated in cells with a missense mutation in Unc93b1, termed “3d” because it affects TLRs 3, 7, and 9 (19, 20). Recognition of virus by pattern recognition receptors is known to be important not only for restricting early virus replication through the induction of antiviral genes, but also for initiating adaptive immune responses, which facilitate eventual viral clearance. To study the role of these pathways in controlling chronic viral infection, we used a mouse model of infection with lymphocytic choriomeningitis virus (LCMV), comparing differences between acute and chronic infections. Type I IFNs (IFN-α/β) have previously been shown to be important for control of both acute and chronic LCMV infections (21–23) and for optimal CD8+ T cell responses (24). However, the role of innate immune nucleic acid recognition pathways in the induction of type I IFN by LCMV, an ssRNA virus, has been controversial, as either MAVS- or MyD88-dependent pathways have been implicated during response to an acute infection (25, 26). In addition, because MyD88 is needed in a CD8+ T cell-intrinsic manner for proper LCMV-specific CD8+ T cell expansion, the role of the TLR pathway in controlling LCMV infection has been difficult to differentiate from the effects of other MyD88-dependent signaling pathways (27). Furthermore, whether these pathways are engaged differently during chronic infection and the relative importance of RLR and TLR pathways for adaptive immune responses and virus control during both acute and chronic infections are not known. To address these important questions and circumvent the intrinsic CD8+ T cell defect in Myd88−/− mice, we used Mavs−/− and Unc93b13d/3d (3d) mice to examine the role of RLRs and nucleic acid-sensing TLRs, respectively, for early and long-term virus control, production of type I IFNs, and the generation and maintenance of CD8+ T cell and Ab responses in both acute and chronic LCMV infections. We find that in Mavs−/− mice, type I IFN production, inhibition of early virus replication, and CD8+ T cell responses were severely affected, leading to delayed but eventual clearance of both acute and chronic LCMV infections. In contrast, in 3d mice, type I IFN production, early virus control, and CD8+ T cell responses were not greatly affected, and these mice were able to clear acute LCMV infection normally. Surprisingly, despite the ability of these mice to clear acute infection, control of chronic infection was severely impaired correlating with a defect in Ab responses and progressive CD8+ T cell exhaustion. These results demonstrate critical roles for innate immune recognition of virus in maintaining adaptive immune responses during chronic viral infection. C57BL/6 (CD45.2+) mice were purchased from The Jackson Laboratory or the National Cancer Institute. CD45.1+ P14 mice bearing the DbGP33-specific TCR were maintained in our animal colony. Mob (IFN-β) reporter mice were generously provided by R. Locksley (University of California, San Francisco, San Francisco, CA) (28). Mavs−/− mice were generously provided by Z. Chen (University of Texas Southwestern Medical Center, Dallas, TX) (29) and crossed to C57BL/6 mice for at least eight generations. Unc93b1 3d mice on a C57BL/6 background were purchased from the Mutant Mouse Regional Resource Center (University of California, Davis, Davis, CA) (20). Myd88−/− mice on a C57BL/6 background were obtained from A. DeFranco (University of California, San Francisco) (30). All experiments were done in accordance with University of California, San Francisco, Institutional Animal Care and Use Committee guidelines. LCMV Armstrong and clone 13 were propagated on BHK cells and titered on Vero cells as previously described (31). For acute infection, mice were infected by i.v. injection with 2 × 106 PFU LCMV Armstrong. For chronic infection, mice were infected i.v. with either 2 × 105 or 2 × 106 PFU LCMV clone 13 where indicated. Plasmacytoid dendritic cells (pDCs) were sorted from uninfected and LCMV-infected spleens at day 1 postinfection (p.i.). pDCs were enriched by negative selection using a biotinylated Ab mixture (CD4, CD19, and Thy1.2), streptavidin microbeads, and an autoMACS instrument (Miltenyi Biotec). Enriched cells were then sorted using Abs to B220 and Siglec-H with DAPI to exclude dead cells on a FACSAria (BD Biosciences). For CFSE labeling, P14 cells were enriched from spleens of transgenic mice using a biotinylated Ab mixture (CD4, B220, I-Ab, NK1.1, CD11b, CD11c, and Ly6G), streptavidin microbeads, and an autoMACS instrument. The purity of P14 cells enriched by autoMACS was ∼90%, and the purity of FACS-sorted pDCs was ∼98%. For non-CFSE–labeled P14 adoptive transfers, 2 × 104 (acute) or 1 × 103 (chronic) CD45.1+ P14 cells were transferred into naive CD45.2+ recipients 1 d prior to infection and analyzed day 5 or 8 p.i. For transfer of CFSE-labeled P14 cells, P14 cells were first enriched using an autoMACS instrument as described earlier. Enriched P14 cells were then labeled in PBS containing 7 μM CFSE (Invitrogen) for 7 min at room temperature. CFSE labeling was quenched with FBS, and cells were washed with RPMI 1640 medium. Labeled P14 cells (1 × 106) were transferred 1 d prior to infection and analyzed 48 h p.i. MHC class I tetramers were a generous gift from R. Ahmed (Emory University School of Medicine, Atlanta, GA). All Abs were purchased from BioLegend except for anti-human granzyme B (Invitrogen), anti-mouse Ly6C and CD62L (BD Pharmingen), anti-mouse CD4, CD16 plus CD32, B220, CD11b, CD19, and Ly6G (University of California, San Francisco, Ab Core Facility), and anti-mouse PDCA-1 (eBioscience). Intracellular cytokine staining was performed as previously described (2). Spleen cells were cultured 5 h in the presence of 1 μg/ml GolgiPlug (BD Biosciences) and 0.2 μg/ml of the indicated peptide prior to staining for surface markers and intracellular cytokines. Flow cytometry was performed on LSRFortessa or FACSCalibur (BD Biosciences) cytometers and analyzed with FlowJo 9.0.2 software (Tree Star). RNA was isolated from snap-frozen tissues using TRIzol Reagent (Invitrogen). After DNase treatment with a Turbo DNA-free kit (Ambion), cDNA was generated from total RNA using an M-MLV reverse transcriptase kit (Invitrogen). Gene expression was determined by quantitative PCR using FastStart Universal SYBR Green Master (ROX; Roche) on an ABI 7300 Real Time PCR System (Applied Biosystems). Expression of type I IFN RNA was normalized to GAPDH. PCR primer pairs are as follows: GAPDH forward, 5′- GGTCTACATGTTCCAGTATGACTCCAC-3′; GAPDH reverse, 5′- GGGTCTCGCTCCTGGAAGAT-3′; IFN-β forward, 5′-CGCTGCGTTCCTGCTGTGCTT-3′; IFN-β reverse, 5′-AGGTGAGGTTGATCTTTCCATTCAG-3′; IFN-α forward, 5′-CTCCTAGACTCAKTCTGCA-3′; IFN-α reverse, 5′-ACACAGTGATSCTGTGGAA-3′ (32). LCMV-specific IgG in serum was detected by solid-phase ELISA as previously described (31). Briefly, 96-well flat-bottom plates were coated with LCMV-infected BHK lysate and then blocked with PBS containing 0.5% Tween 20 (Bio-Rad) and 10% FBS. After blocking, serially diluted serum was added, and anti-mouse IgG conjugated to HRP was used as a secondary Ab (Southern Biotech). 3,3′,5,5′-tetramethylbenzidine was used as substrate. Ab titers were determined as the reciprocal of the dilution that gave an OD value (450 nm) reading more than 2-fold above that of naive control sera. For each graph, sera samples were analyzed by ELISA concurrently. All statistical analysis was performed using a two-tailed unpaired Student t test with Prism software (GraphPad Software). To determine how innate virus-sensing pathways contributed to the control of a chronic viral infection, we used the LCMV model in which infection of wild-type (WT) mice with the Armstrong strain results in acute infection and viral clearance within 8–10 d, whereas infection with a closely related variant, clone 13, results in chronic infection with viral persistence for several months (31). Whereas WT mice efficiently controlled virus by 8 d p.i. 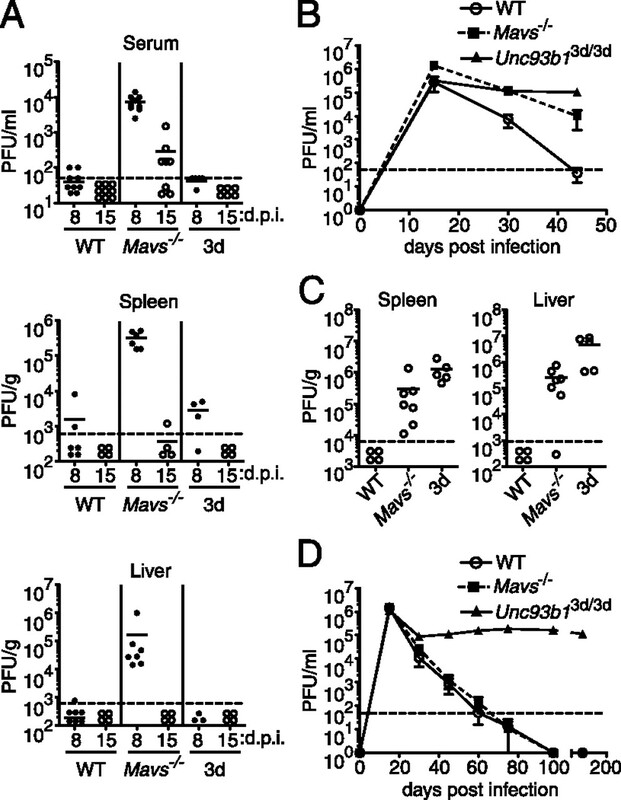 with LCMV Armstrong, Mavs−/− mice had elevated virus titers in serum, spleen, and liver (Fig. 1A). In contrast, 3d mice had similar levels of virus control as in WT mice. Although Mavs−/− mice had high levels of virus at day 8 p.i., these mice eventually cleared virus from serum and tissues by day 15 or shortly thereafter. Furthermore, we did not detect any infectious virus in serum and multiple tissues, including brain and kidney, at day 30 and later p.i. (data not shown). These data suggest that although the RLR pathway is primarily important in controlling acute infection with LCMV, deficiency in one pathway alone is not sufficient for establishment of a chronic infection with LCMV Armstrong. Both nucleic acid-sensing TLRs and the RLR pathway are necessary for control of a chronic viral infection, but only the RLR pathway is required for control of an acute infection. WT, Mavs−/−, and Unc93b13d/3d (3d) mice were infected with LCMV Armstrong (A) or clone 13 (B, C), and viral titers were assessed by plaque assay. (A) Viral loads in serum, spleen, and liver on 8 and 15 d p.i. with Armstrong are shown (n = 3 to 9). (B) Longitudinal analysis of viral titers in sera of mice infected with 2 × 105 PFU clone 13. Data shown are mean ± SEM. (C) Viral titers in spleen and liver at day 44 p.i. with clone 13. (D) Longitudinal analysis of viral titers in sera of mice infected with 2 × 106 PFU clone 13. Graphs show mean ± SEM (n = 4 to 5 mice per group). Data in (A) are pooled from three or more independent experiments. Data shown in (B) and (C) are representative of three independent experiments (n = 4 to 8 mice per group). Data in (D) are representative of two independent experiments. For (A) and (C), the mean is shown as a solid line with data points representing individual mice. Dotted lines indicate the limits of detection. d.p.i., days postinfection. Because the necessity for virus-sensing pathways may differ in acute and chronic infections, we investigated the role of RLR and nucleic acid-sensing TLR pathways in a chronic viral infection with clone 13. Clone 13 has been well established to replicate and spread more rapidly within the first few days of infection compared with LCMV Armstrong (33). Because the dose of clone 13 used in most studies, 2 million PFU per mouse, already seems to overcome effects of the innate response and rapidly leads to CD8+ T cell exhaustion in a WT host, for our initial studies, we infected WT, Mavs−/−, and 3d mice with a 10-fold lower dose of this strain and monitored virus clearance. Whereas WT mice eliminated virus in serum, spleen, and liver by day 44 p.i., similarly to acute infection with LCMV, Mavs−/− mice exhibited defective clearance of clone 13 at this time point, with higher levels of viremia at days 15 and 30 p.i., and detectable virus present in serum and tissues at day 44 p.i. (Fig. 1B, 1C). Surprisingly, although nucleic acid-sensing TLRs were dispensable for clearance of acute LCMV infection, 3d mice failed to control infection with clone 13. Levels of virus in WT and 3d mice were relatively equivalent at day 15 p.i. (Fig. 1B), but 3d mice maintained elevated virus levels in serum and tissues throughout the course of observation. Consistent with these results, when infected with 2 × 106 PFU clone 13, 3d mice failed to clear virus at times as late as day 160 p.i. (Fig. 1D). In contrast, with the higher dose of clone 13, the kinetics of clearance in Mavs−/− mice were similar to that in WT mice indicating that the higher dose of virus likely overcomes MAVS-dependent effects on virus control (Fig. 1D). These data demonstrate that both the RLR and nucleic acid-sensing TLR pathways are necessary for control of LCMV infection. Importantly, though these receptors have the potential to activate similar downstream pathways, they act in seemingly nonredundant ways due to the differing necessity for these pathways in control of acute or chronic LCMV infections. To understand the mechanism(s) by which the RLR and nucleic acid-sensing TLR pathways may affect the clearance of LCMV, we analyzed virus-specific CD8+ T cell responses, as CD8+ T cells are required for control of acute infection (34, 35), and chronic infection has been shown to lead to the loss of CD8+ T cell effector functions, which contributes to virus persistence (2, 4). At the peak of the CD8+ T cell response to acute LCMV infection, whereas ∼25% and ∼18% of CD8+ T cells in WT and 3d mice made IFN-γ in response to the GP33-41 and NP396-404 LCMV epitopes, respectively, only ∼5% of CD8+ T cells in Mavs−/− mice responded to stimulation with these peptides (Fig. 2A). Furthermore, only ∼1% or less of CD8+ T cells in Mavs−/− mice were able to make both IFN-γ and TNF-α to all epitopes, indicating a functional state of exhaustion (Fig. 2A, 2C). 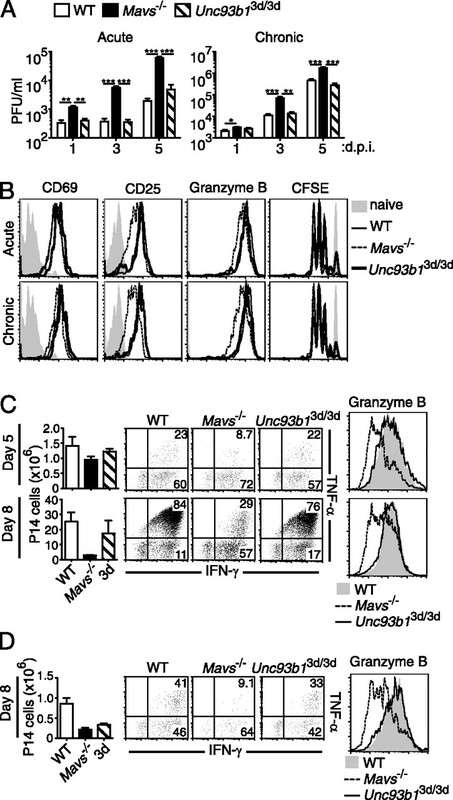 In addition to defective cytokine production, CD8+ T cells in Mavs−/− mice exhibited severely impaired production of granzyme B, in contrast to WT and 3d mice, which expressed equivalent levels (Fig. 2A). We did observe some minor differences between WT and 3d mice in the frequency of CD8+ T cells that made both IFN-γ and TNF-α in response to one epitope, GP276-86, but not to GP33-41 or NP396-404 (Fig. 2A, 2C). However, the response to this epitope in 3d mice was still greater than that in Mavs−/− mice, and because of the relatively low frequency of CD8+ T cells that respond to this peptide compared with responses to NP396 and GP33, it is likely that the dominant effect of these epitopes is enough to control the infection (Fig. 1A). Differential effects of the loss of innate virus-sensing pathways on virus-specific CD8+ T cell function in acute and chronic viral infection. (A–D) Analysis of virus-specific CD8+ T cell responses in WT, Mavs−/−, and Unc93b13d/3d (3d) mice infected with LCMV Armstrong at day 8 p.i. (A) Top, Splenocytes were incubated with the indicated peptides for 5 h, and the frequency of responding CD8+ T cells was determined by intracellular staining for IFN-γ and TNF-α. Numbers within plots indicate frequency of cytokine-producing cells within that quadrant. Bottom, Expression of granzyme B by DbGP33-tetramer+ CD8+ T cells was analyzed by intracellular staining. Numbers within histograms indicate the mean fluorescence intensity. (B) Total DbGP33- and DbGP276-specific CD8+ T cells were quantified in spleens of infected mice. (C) The frequency of CD8+ T cells that are IFN-γ+TNF-α+ in response to peptide stimulation as described in (A) was determined. (D) Expression of Ly6C, Tim-3, and PD-1 on DbGP33-specific CD8+ T cells was analyzed by flow cytometry in WT (shaded), Mavs−/− (dashed line), and 3d (solid line) mice. Data in (A)–(D) represent three or more independent experiments (n = 4 to 9 mice per group). 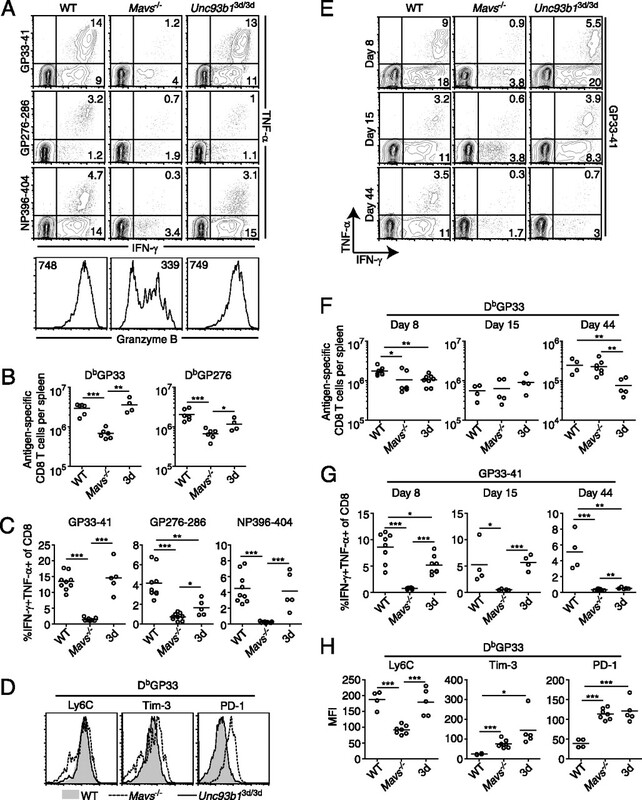 (E–H) Analysis of virus-specific CD8+ T cell responses in mice infected with 2 × 105 PFU LCMV clone 13 at days 8, 15, and 44 p.i. (E) Expression of IFN-γ and TNF-α by CD8+ T cells at the indicated times p.i. was determined as described in (A) for GP33-41 peptide. (F) Total numbers of DbGP33-specific CD8+ T cells were determined in spleens of infected mice by tetramer staining. (G) The frequency of CD8+ T cells producing both IFN-γ and TNF-α in response to GP33-41 peptide at different times p.i. as shown in (E) was analyzed. (H) The mean fluorescence intensity (MFI) of Ly6C, Tim-3, and PD-1 is shown for DbGP33-specific CD8+ T cells at day 44 p.i. For (E)–(H), data are from two to four independent experiments: day 8 (n = 6–8), day 15 (n = 4–5), and day 44 (n = 4–8) for each group. Graphs show the mean as a line, and each data point represents an individual mouse. *p < 0.05, **p < 0.01, ***p < 0.001 (two-tailed unpaired Student t test). In addition to qualitative deficiencies, CD8+ T cells in Mavs−/− mice also exhibited quantitative differences in the number of LCMV-specific CD8+ T cells, as determined by tetramer staining at the peak of response (Fig. 2B). Mavs−/− mice had ∼4-fold fewer DbGP33-specific and 3-fold fewer DbGP276-specific CD8+ T cells compared with those of WT mice. In contrast, 3d mice had roughly equivalent numbers of DbGP33-specific CD8+ T cells as WT mice, and although they had fewer DbGP276-specific CD8+ T cells, this difference was less than 2-fold and was not statistically significant. Functional exhaustion in CD8+ T cells is associated with altered expression of activation markers and upregulation of multiple inhibitory receptors (3, 6). Consistent with previous reports describing higher expression of T cell Ig and mucin domain-containing molecule 3 (Tim-3) and programmed death 1 (PD-1) on virus-specific CD8+ T cells during chronic viral infection (5, 7–9), DbGP33-specific (Fig. 2D) and DbGP276-specific (Supplemental Fig. 1A) CD8+ T cells in Mavs−/− mice expressed higher levels of these inhibitory receptors compared with those of WT and 3d mice. In addition, LCMV-specific CD8+ T cells in Mavs−/−, but not 3d mice, had decreased expression of Ly6C, which decreases in expression on virus-specific T cells in chronically infected mice (3). These results demonstrate that the RLR pathway, but not nucleic acid-sensing TLRs, is critical for optimal CD8+ T cell responses and virus clearance during acute LCMV infection. Next, we examined the role for the RLR and nucleic acid-sensing TLR pathways in maintaining CD8+ T cell function during chronic infection with LCMV. Similarly to acute infection, virus-specific CD8+ T cells in Mavs−/− mice were severely impaired in their ability to make IFN-γ and TNF-α at days 8, 15, and 44 p.i. in response to GP33 peptide (Fig. 2E, 2G). However, in contrast to the dispensability of nucleic acid-sensing TLRs for acute infection, absence of these TLRs led to a gradual loss of CD8+ T cell function during chronic infection. At days 8 and 15 p.i. with clone 13, the frequency of CD8+ T cells making IFN-γ in response to GP33 (Fig. 2E) was roughly equivalent in WT and 3d mice, although the frequency of CD8+ T cells producing both IFN-γ and TNF-α varied slightly (Fig. 2G). Approximately 3% fewer CD8+ T cells in 3d mice expressed both IFN-γ and TNF-α in response to GP33 peptide at day 8, but not at day 15, p.i. compared with WT (Fig. 2G). Although these differences in T cell function at days 8 and 15 were minimal, by day 44 p.i., LCMV-specific CD8+ T cells in 3d mice were severely exhausted, corresponding to their inability to control viral replication (Fig. 1B). At day 44, LCMV-specific CD8+ T cells in 3d mice had impaired production of both IFN-γ and TNF-α to levels comparable with those in Mavs−/− mice (Fig. 2E, 2G). As a consequence of increased levels of viremia (Fig. 1B), virus-specific CD8+ T cells in Mavs−/− and 3d mice at day 44 p.i., in addition to their decreased functional status, also expressed higher levels of the inhibitory receptors Tim-3 and PD-1 compared to WT mice (Fig. 2H). Notably, Ly6C expression at day 44 was significantly decreased in Mavs−/− but not 3d mice and may indicate different rates of exhaustion, as its expression has been shown gradually to decrease throughout the course of chronic infection in WT mice (3). Similar results were observed in response to GP276 peptide (Supplemental Fig. 1B, 1D, 1E). Numbers of virus-specific CD8+ T cells in spleens were also measured by tetramer staining at days 8, 15, and 44 after clone 13 infection (Fig. 2F). Although numbers of DbGP33-specific cells in Mavs−/− and 3d mice were slightly lower compared with those in WT at day 8 p.i., these differences were less than 2-fold in magnitude (Fig. 2F). However, by day 44 p.i., 3d mice had a more than 3-fold decrease in numbers of DbGP33-specific CD8+ T cells. Similar results were seen for DbGP276-specific CD8+ T cells (Supplemental Fig. 1C). Mavs−/− mice had consistently lower frequencies of tetramer-positive cells within the CD8+ T cell population, but when total numbers of Ag-specific cells were evaluated, these deficiencies were largely offset by larger spleen sizes. This suggests that early CD8+ T cell exhaustion in Mavs−/− mice may prevent immune-mediated immunopathology. This is consistent with the observation that mice depleted of CD8+ T cells show reduced disruption of splenic architecture and increased splenic cellularity following infection with clone 13 (36). These data demonstrate that the RLR and nucleic acid-sensing TLR pathways play distinct roles in the regulation of virus-specific CD8+ T cell responses. Whereas RLR signaling is required early after either acute or chronic LCMV infection, nucleic acid-sensing TLRs are required only later during chronic infection to prevent persistence of virus and CD8+ T cell exhaustion. Because type I IFNs are known to play important roles in virus clearance and CD8+ T cell responses to LCMV, we sought to analyze the contribution of RLRs and nucleic acid-sensing TLRs to type I IFN production during acute and chronic LCMV infections. To determine the peak of type I IFN production, we performed a kinetic analysis by quantitative RT-PCR of type I IFN in spleens at multiple time points p.i. with either LCMV Armstrong or clone 13 (Fig. 3A). Type I IFN production was transient, detectable as early as 8 h p.i., reaching peak levels at 16–24 h, and decreasing to near baseline levels by 72 h p.i. for both Armstrong and clone 13, consistent with previous reports (37). To identify type I IFN-producing cells, we used Mob (IFN-β) reporter mice, in which an IRES-YFP cassette is inserted into the endogenous Ifnb1 locus downstream of the stop codon, preserving regulatory elements in the 3′-untranslated region, thus marking IFN-β–producing cells (28). When Mob mice were analyzed on day 1 p.i., at the peak of the type I IFN response, the majority of spleen cells (∼90%) expressing YFP had surface markers consistent with pDCs (Fig. 3B). Because production of type I IFN by pDCs in response to virus has been shown to be dependent on expression of nucleic acid-sensing TLRs (38), we generated Mob mice carrying the Unc93b13d/3d mutation (Mob-3d) and analyzed the ability of pDCs to produce IFN-β at day 1 p.i. with LCMV Armstrong or clone 13 (Fig. 3C). In response to either strain, ∼45% of pDCs in Mob mice expressed YFP at day 1 p.i., and this was dependent on nucleic acid-sensing TLRs, consistent with results seen using MyD88-deficient Ifna6 reporter mice (25). Furthermore, the transient expression of IFN-β by pDCs was equivalent in mice infected with either Armstrong or clone 13 at multiple times examined (Fig. 3D). Dependency of pDC IFN-α/β expression on nucleic acid-sensing TLRs in response to LCMV infection was verified by quantitative RT-PCR in sorted pDCs from LCMV-infected 3d mice, and levels were equivalent to those in Myd88−/− pDCs (Fig. 3E). Unexpectedly, when levels of IFN-β and IFN-α were determined in whole spleens of mice infected with LCMV Armstrong or clone 13 at day 1 p.i. by quantitative RT-PCR, there were no differences in levels of type I IFN transcripts in 3d mice compared with WT (Fig. 3F). These results are corroborated by recent reports showing that depletion of pDCs and loss of nucleic acid-sensing TLR signaling have no effects on levels of type I IFN in acute LCMV infection (26, 39). In contrast, there were large decreases in both IFN-α and IFN-β in Mavs−/− mice (Fig. 3F). For both acute and chronic infections, IFN-α expression was affected to a greater degree than IFN-β, and type I IFN expression in chronic infection was affected to a larger extent by MAVS deficiency than in acute infection. Therefore, although nucleic acid-sensing TLRs in pDCs and the RLR pathway are both activated in response to infection, the RLR pathway is the primary innate pathway contributing to early type I IFN production in both acute and chronic LCMV infection. Both the nucleic acid-sensing TLR and RLR pathways are activated early p.i. with LCMV. Mice were infected with either LCMV Armstrong (acute) or 2 × 106 PFU clone 13 (chronic), and production of type I IFN was analyzed. (A) Expression of mRNA for IFN-β and IFN-α was analyzed in spleens of infected mice at the indicated time points by quantitative RT-PCR. Data are representative of two independent experiments and show mean ± range (n = 2 for each time point). (B) Mob (IFN-β) reporter mice were analyzed for reporter expression by flow cytometry. Phenotyping of YFP+ cells in spleen at day 1 p.i. is shown for a representative experiment. (C) Reporter expression in pDCs from uninfected or day 1 Armstrong (acute) or clone 13 (chronic) infected Mob and Mob-3d mice was analyzed by flow cytometry. Density plots are gated on PDCA-1hi, Siglec-H+ splenocytes. (D) The frequency of YFP+ pDCs in spleens at the indicated time points p.i. in Mob mice is shown (mean ± SEM). Data in (C) and (D) represent two independent experiments (n = 2 to 5 mice per group). (E) IFN-β and IFN-α mRNA expression was analyzed by quantitative RT-PCR in sorted pDCs from uninfected or day 1 LCMV Armstrong-infected mice of the indicated genotypes. Data for each group are averages of two to five independently sorted samples (n = 2 to 4 mice per sample). (F) IFN-β and IFN-α mRNA expression was analyzed by quantitative RT-PCR in spleens of the indicated mice at day 1 p.i with either Armstrong (acute) or clone 13 (chronic). Data for each group are averages of individual mice pooled from eight different experiments. For RT-PCR, mRNA expression was normalized to GAPDH. All data are expressed as mean ± SEM. *p < 0.05, **p < 0.01, ***p < 0.001 (two-tailed unpaired Student t test). Because both RLR and nucleic acid-sensing TLR-dependent pathways are activated early in response to LCMV infection, we assessed the contribution of these pathways to early virus control and CD8+ T cell activation, which may affect the long-term ability of mice deficient in either of these pathways to limit chronic infection. To determine the necessity of RLR and nucleic acid-sensing TLR pathways for early restriction of virus replication, we analyzed the level of virus in sera of mice infected with LCMV Armstrong or clone 13 at days 1, 3, and 5 p.i. Deficiency in MAVS resulted in significantly increased viral loads at almost all time points examined for both acute and chronic infection (Fig. 4A). In contrast, loss of nucleic acid-sensing TLRs had no appreciable effect on levels of virus for either acute or chronic infection. The RLR pathway is important for early control of viral replication and optimal CD8+ T cell activation. (A) WT, Mavs−/−, and Unc93b13d/3d (3d) mice were infected with LCMV Armstrong (acute) or 2 × 106 PFU clone 13 (chronic) and viral titers in serum analyzed at days 1, 3, and 5 p.i. by plaque assay (n = 4 to 5). (B) CFSE-labeled CD45.1+ P14 cells were transferred into CD45.2+ WT (thin solid line), Mavs−/− (dashed line), or 3d (thick solid line) recipient mice and infected 1 d later with either 2 × 106 PFU LCMV Armstrong (acute), clone 13 (chronic), or left uninfected (shaded histograms). Forty-eight hours p.i., cell division by CFSE dilution and the expression of CD69, CD25, and granzyme B on transferred cells were determined by flow cytometry. Histograms are gated on CD45.1+ P14 cells. Expression levels and CFSE dilution in uninfected mice are shown in shaded histograms. (C and D) CD45.1+ P14 cells were adoptively transferred into CD45.2+ WT, Mavs−/−, or 3d recipient mice and infected the next day with LCMV Armstrong (C) or 2 × 105 PFU clone 13 (D). Graphs on the left show the number of P14 cells in spleens in each recipient group at the indicated times p.i. Expression of IFN-γ and TNF-α (density plots) and granzyme B (histograms) was determined by intracellular staining at days 5 (Armstrong) and 8 (Armstrong and clone 13) p.i. Plots and histograms are gated on transferred P14 cells. Data in (A)–(D) are representative of two or more independent experiments. For (A), graphs show mean ± SEM. For (C) and (D), graphs show mean ± range for a representative experiment (n = 2). *p < 0.05, **p < 0.01, ***p < 0.001 (two-tailed unpaired Student t test). To determine the effect of these pathways on early activation of virus-specific CD8+ T cells, we adoptively transferred WT CFSE-labeled CD45.1+ TCR Tg P14 cells, which recognize the LCMV GP33 epitope in the context of H-2Db, into CD45.2+ WT, Mavs−/−, or 3d recipient mice. Adoptively transferred mice were then infected with LCMV Armstrong or clone 13 and analyzed for proliferation and expression of various activation markers at 48 h p.i. (Fig. 4B). CD69 is induced in T cells upon stimulation with either Ag or IFN-α/β (40). However, we did not observe significant differences in CD69 expression on P14 cells transferred into Mavs−/− mice compared with that on those transferred into WT or 3d recipients (Fig. 4B). This may be due to the fact that direct effects of TCR stimulation on CD69 expression may compensate for the relatively lower IFN levels. Shortly after activation, Ag-specific CD8+ T cells also express CD25, the high-affinity IL-2 receptor α-chain (41, 42). Whereas in response to acute or chronic LCMV infection, P14 cells transferred into WT and 3d mice expressed high levels of CD25, P14 cells transferred into Mavs−/− recipients showed a broader range of CD25 expression with both high- and low-expressing cells (Fig. 4B). Granzyme B expression was also lower in Mavs−/− recipients, consistent with the observed phenotype in virus-specific CD8+ T cells at day 8 p.i. with LCMV Armstrong (Figs. 2A, 4B). In contrast to the observed defects in the activation of P14 cells transferred into Mavs−/− mice, these cells had no defect in proliferation, as measured by CFSE dilution, compared with WT recipients (Fig. 4B). Conversely, P14 cells that were transferred into 3d mice exhibited no aberrant activation compared with WT recipients but demonstrated slightly decreased proliferation with respect to WT and Mavs−/− recipients (Fig. 4B). Additionally, ∼10% of donor P14 cells in 3d mice had not proliferated, compared with ∼1–2% in WT and Mavs−/− mice, suggesting there may be a slight defect in recruitment of Ag-specific T cells in the absence of nucleic acid-sensing TLRs. To determine how differences in early activation and viral load affected later CD8+ T cell responses, we assessed the numbers and function of P14 cells at day 5 and 8 p.i. with LCMV Armstrong (Fig. 4C) or clone 13 (Fig. 4D) after transfer into WT, Mavs−/−, or 3d mice. Similarly to results seen with endogenous LCMV-specific CD8+ T cells at day 8 p.i. (Fig. 2A, 2E), P14 cells in Mavs−/− recipients demonstrated decreased functionality at day 5 (Armstrong) and day 8 (Armstrong and clone 13) of LCMV infection by intracellular staining for both granzyme B and the effector cytokines IFN-γ and TNF-α (Fig. 4C, 4D). 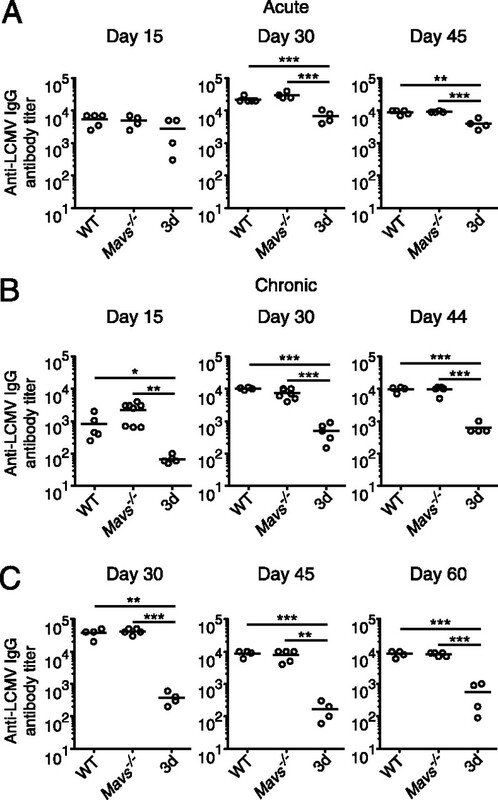 Although numbers of P14 cells in Mavs−/− mice were roughly equivalent to those in WT recipients at day 5 after acute infection, by day 8 they exhibited a roughly 10-fold decrease in relative numbers (Fig. 4C). P14 cells in Mavs−/− recipients exhibited a similar, though less dramatic, defect in chronically infected mice (Fig. 4D). In contrast, P14 cells transferred into 3d mice had levels of granzyme B, IFN-γ, and TNF-α expression similar to WT in both acute and chronic LCMV infections (Fig. 4C, 4D). Total numbers of P14 cells in 3d mice were slightly decreased compared with those of WT mice at day 5 and 8 p.i. with Armstrong but showed a more pronounced, ∼3-fold decrease during clone 13 infection at day 8 (Fig. 4C, 4D) similar to results seen with endogenous DbGP33-specific cells (Fig. 2B, 2F). These results demonstrate that MAVS deficiency affects both early virus control and CD8+ T cell activation. In contrast, nucleic acid-sensing TLRs do not contribute to early virus control but have a discernible impact on early recruitment and proliferation of Ag-specific CD8+ T cells. Although both Mavs−/− and 3d mice failed to control low-dose clone 13 infection with the same kinetics as WT mice (Fig. 1B, 1C), the differences in the kinetics of viral titers and LCMV-specific CD8+ T cell dysfunction suggested a different mechanism by which nucleic acid-sensing TLRs contributed to control of a persistent infection. One possibility is that viral recognition by nucleic acid-sensing TLRs may be responsible for low-level type I IFN production at later time points that contributes to virus control. However, we were unable to detect significant levels of type I IFN at various time points later during chronic infection by quantitative RT-PCR (data not shown), consistent with previous reports (37, 43). In addition to T cell-mediated immunity, Abs have also been shown to be necessary for resolution of chronic LCMV infection (10). Therefore, we investigated the contributions of the RLR and nucleic acid-sensing TLR pathways to LCMV-specific Ab responses. After acute infection with LCMV Armstrong, levels of LCMV-specific IgG were not significantly different at day 15 p.i. in either Mavs−/− or 3d mice, but at days 30 and 45 p.i., LCMV-specific IgG titers were approximately 3- and 2-fold decreased in 3d mice, respectively, compared with those in WT mice with no differences seen for Mavs−/− mice (Fig. 5A). In contrast, during chronic infection with LCMV, 3d but not Mavs−/− mice exhibited defective LCMV-specific IgG production throughout the course of infection that was more severe than during acute infection (Fig. 5B). At day 15 p.i., LCMV-specific IgG titers in clone 13-infected 3d mice were ∼10-fold lower than those in WT mice, and at days 30 and 44 p.i., 3d mice had approximately 20-fold less LCMV-specific IgG. In mice infected with 2 × 106 PFU clone 13, LCMV-specific Ab titers were similarly affected, with no differences between WT and Mavs−/− mice but approximately 15- to 100-fold lower titers of anti-LCMV IgG at days 30, 45, and 60 p.i. in 3d mice compared with those in WT (Fig. 5C). These results demonstrate that impaired Ab production likely contributes to persistence of virus in mice deficient in signaling through nucleic acid-sensing TLRs. Furthermore, larger differences in Ab levels between WT and 3d mice in chronic compared with acute infection suggests that continued stimulation through nucleic acid-sensing TLRs may play a role in maintaining Ab responses during chronic viral infection. Nucleic acid-sensing TLRs are necessary for optimal virus-specific Ab responses in a chronic viral infection. WT, Mavs−/−, and Unc93b13d/3d (3d) mice were infected with LCMV Armstrong (acute) or clone 13 (chronic), and LCMV-specific IgG Ab titers in sera were measured by ELISA. (A) Ab titers were analyzed in Armstrong-infected mice at days 15, 30, and 45 p.i. (n = 4 to 5). (B) Ab titers at days 15, 30, and 44 p.i. with 2 × 105 PFU clone 13 were determined in the indicated mice (n = 4 to 8). (C) Ab titers at days 30, 45, and 60 p.i. in indicated mice infected with 2 × 106 PFU clone 13 (n = 4 to 5). Data are representative of two or more independent experiments. Graphs show the mean as a line, and each data point represents an individual mouse. *p < 0.05, **p < 0.01, ***p < 0.001 (two-tailed unpaired Student t test). Our results demonstrate clearly that both nucleic acid recognition pathways are involved in the recognition of LCMV and contribute to control of a chronic viral infection, but through distinct mechanisms. Recognition of viruses via innate pathways may exert their influence on chronic infection in a variety of ways: prevention of early virus replication and spread; initiation of adaptive immune responses; and maintenance of adaptive immune responses and virus control later in infection. Although the first two are not unique to chronic viral infections, they are nonetheless important for establishment of infection. It was apparent from our studies that although both the nucleic acid-sensing TLR pathway and the MAVS-dependent RLR pathway are engaged early during LCMV infection, the RLR pathway was of primary importance for the induction of type I IFNs, limiting early virus replication, and producing effective CD8+ T cell responses during both acute and chronic LCMV infections. This is in contrast to a report demonstrating compensation by RLR and TLR pathways for type I IFN and CD8+ T cell responses to influenza (44). The effect of the RLR pathway on control of LCMV infection is consistent with decreased levels of type I IFN, although effects from differences in other innate mediators cannot be excluded. Mavs−/− mice exhibited increased viral titers early during the course of infection consistent with studies in type I IFN receptor-deficient mice (21, 23). Importantly, viral clearance in Mavs−/− mice was not impaired as greatly as that in type I IFN receptor-deficient mice, consistent with our results showing other sources of type I IFN. IFN-α/β has been shown to act as a “signal 3” for CD8+ T cells and can induce the expression of granzyme B and CD25, among other genes (45, 46). Type I IFN receptor-deficient CD8+ T cells also express lower levels of granzyme B in response to LCMV infection, demonstrating a T cell-intrinsic requirement for type I IFN signaling (24). Notably, differences in CD25 expression can also affect levels of granzyme B, so virus-specific CD8+ T cells in Mavs−/− mice may have a compounded defect through both decreased IFN-α/β and IL-2 signaling (41, 42). It has also been shown that exposure to type I IFN or IL-2 affects cell death or proliferation, respectively, in LCMV-specific CD8+ T cells (24, 41). It will be interesting to see whether this contributes to decreased numbers of Ag-specific CD8+ T cells in Mavs−/− mice. Whether virus-specific CD8+ T cell dysfunction in Mavs−/− mice results more from defects in priming or is caused by elevated levels of Ag remains unclear, although both likely contribute. However, given the well-known role for CD8+ T cells in controlling chronic viral infections (47) and the normal Ab responses in Mavs−/− mice, it is likely that defective CD8+ T cell responses are a major cause of ineffective control of both acute and low-dose chronic LCMV infections in Mavs−/− mice. Notably, despite early severe LCMV-specific CD8+ T cell defects, Mavs−/− mice control a high dose of clone 13 with kinetics similar to WT mice. The differences seen when using the lower and higher doses of clone 13 may result from the kinetics of CD8+ T cell exhaustion, which becomes faster in WT mice with high-dose inoculation. In contrast to the multitude of early virus control and CD8+ T cell deficits in Mavs−/− mice, 3d mice demonstrated normal control of early virus replication for both acute and chronic infections and had relatively normal early CD8+ T cell responses. This is in contrast to Myd88−/− mice, which fail to control acute LCMV infection and have a CD8+ T cell-intrinsic expansion defect (27), demonstrating that this effect is independent of nucleic acid-sensing TLRs. There was, however, a slight recruitment and proliferation defect early following infection when P14 cells were transferred into 3d mice. Because APCs, such as various subsets of conventional DCs, express a wide array of TLRs, this may indicate a role for nucleic acid-sensing TLRs in optimal activation and homing of APCs (17). However, the extent that this affected CD8+ T cell numbers and function is unclear. It has been shown that when different Ag doses were given, this affected recruitment of Ag-specific CD8+ T cells, but all recruited cells divided efficiently and demonstrated similar effector functions (48). Additionally, assuming ∼10% take of transferred P14 cells, the precursor frequency of DbGP33-specific P14 cells in our transfer experiment was approximately a thousand times greater than numbers of endogenous cells, thereby greatly increasing competition for Ag (49). Therefore, recruitment of endogenous CD8+ T cells in 3d mice may not be similarly affected, although this may account for slightly reduced numbers of DbGP276-specific T cells, a subdominant epitope for which competition may be more stringent (2, 50). Although production of type I IFN by pDCs was dependent on nucleic acid-sensing TLRs, type I IFN has not been detected at later time points of chronic infection after transient production early in the response (37, 43). We were also not able to detect IFN-producing cells in Mob reporter mice at day 8 or 15 p.i. with clone 13 (data not shown), indicating an unlikely role for type I IFN in the maintenance of immune responses in 3d mice. In contrast, our data indicate a significant role for nucleic acid-sensing TLRs in controlling chronic infection through anti-viral Ab production. This is particularly interesting given a recent study showing that virus-specific CD4+ T cells gradually differentiate into T follicular helper (Tfh) cells during chronic LCMV infection, driving germinal center B cell development and Ab responses that assist in controlling persistent infection (12). Similar to our results in 3d mice, mice that lack CXCR5, which is necessary for Tfh interaction with germinal center B cells, had severe defects in Ab production that were more pronounced in chronic compared with acute LCMV infection (12). One possibility is that chronic stimulation of nucleic acid-sensing TLRs on DCs may drive Tfh differentiation, which in turn drives Ab responses, and through the production of IL-21 can also function to maintain CD8+ T cell responses (11, 13, 15). Additionally, DCs in 3d mice may have disruptive presentation of exogenous Ags, which could impair the development of Tfh cells (20). Another, nonexclusive, possibility is that nucleic acid-sensing TLRs are required intrinsically for anti-viral B cell function. This could either be as an adjuvant effect from directly engaging TLR7 on virus-specific B cells (51) or through the maintenance of B cell function, as “exhausted” B cells have recently been described during chronic infection of individuals with HIV (52). Because of the expression of TLR3 in DC subsets and TLR7 and TLR9 in both DCs and B cells (16), it will be important to determine which nucleic acid-sensing TLRs in which cell types are necessary. Given the intertwined nature of DCs, Tfh cells, and B cells, it is likely that recognition of virus through these TLRs exerts its effect on Ab responses in multiple ways. Although our results imply different requirements for nucleic acid-sensing TLRs in the Ab response during acute and chronic viral infection, further studies are needed to determine if continuous TLR stimulation is necessary to maintain Ab responses. Because it is clear that different innate viral recognition pathways differentially impact adaptive immune responses, further understanding of the roles these pathways play in other chronic viral infections such as HIV, hepatitis C virus, and hepatitis B virus may lead to more targeted immune interventions. We are grateful for the generosity of Richard Locksley for Mob mice, Anthony DeFranco for Myd88−/− mice, Art Weiss and Richard Locksley for use of various equipment, Hong Wu and Rafi Ahmed for tetramers and helpful discussion, respectively, and Anthony DeFranco and Lewis Lanier for critically reading the manuscript. We also thank Cliff McArthur, Zhi-en Wang, and Stephen Chmura for help with cell sorting and Kendall Madden and Abraham Noorbakhsh for technical assistance. This work was supported by a Graduate Research fellowship (to J.M.C.) from the National Science Foundation. M.M. was supported in part by the Rosalind Russell Medical Research Center for Arthritis and by National Institutes of Health Grant 1RO1AI074694.
. 2009. Redefining chronic viral infection. Cell 138: 30–50.
. 2003. Viral persistence alters CD8 T-cell immunodominance and tissue distribution and results in distinct stages of functional impairment. J. Virol. 77: 4911–4927.
. 2009. Impaired antibody response causes persistence of prototypic T cell-contained virus. PLoS Biol. 7: e1000080.
. 2009. IL-21 is required to control chronic viral infection. Science 324: 1569–1572.
. 2011. Viral persistence redirects CD4 T cell differentiation toward T follicular helper cells. J. Exp. Med. 208: 987–999.
. 2009. IL-21R on T cells is critical for sustained functionality and control of chronic viral infection. Science 324: 1576–1580.
. 1994. CD4+ T cells are required to sustain CD8+ cytotoxic T-cell responses during chronic viral infection. J. Virol. 68: 8056–8063. 2011. Immune signaling by RIG-I-like receptors. Immunity 34: 680–692.
. 2008. UNC93B1 delivers nucleotide-sensing toll-like receptors to endolysosomes. Nature 452: 234–238.
. 2006. The Unc93b1 mutation 3d disrupts exogenous antigen presentation and signaling via Toll-like receptors 3, 7 and 9. Nat. Immunol. 7: 156–164.
. 1999. Two roads diverged: interferon alpha/beta- and interleukin 12-mediated pathways in promoting T cell interferon gamma responses during viral infection. J. Exp. Med. 189: 1315–1328.
. 1994. Functional role of type I and type II interferons in antiviral defense. Science 264: 1918–1921.
. 2008. Lymphocytoid choriomeningitis virus activates plasmacytoid dendritic cells and induces a cytotoxic T-cell response via MyD88. J. Virol. 82: 196–206.
. 2010. Induction and inhibition of type I interferon responses by distinct components of lymphocytic choriomeningitis virus. J. Virol. 84: 9452–9462.
. 2008. MyD88 plays a critical T cell-intrinsic role in supporting CD8 T cell expansion during acute lymphocytic choriomeningitis virus infection. J. Immunol. 181: 3804–3810.
. 2008. Visualization of IFNbeta production by plasmacytoid versus conventional dendritic cells under specific stimulation conditions in vivo. Proc. Natl. Acad. Sci. USA 105: 20416–20421.
. 2006. The specific and essential role of MAVS in antiviral innate immune responses. Immunity 24: 633–642.
. 1998. Targeted disruption of the MyD88 gene results in loss of IL-1- and IL-18-mediated function. Immunity 9: 143–150.
. 1984. Selection of genetic variants of lymphocytic choriomeningitis virus in spleens of persistently infected mice. Role in suppression of cytotoxic T lymphocyte response and viral persistence. J. Exp. Med. 160: 521–540.
. 2009. The IFN regulatory factor 7-dependent type I IFN response is not essential for early resistance against murine cytomegalovirus infection. Eur. J. Immunol. 39: 1007–1018.
. 1993. Molecular determinants of macrophage tropism and viral persistence: importance of single amino acid changes in the polymerase and glycoprotein of lymphocytic choriomeningitis virus. J. Virol. 67: 7340–7349.
. 1994. Cytotoxicity mediated by T cells and natural killer cells is greatly impaired in perforin-deficient mice. Nature 369: 31–37.
. 1994. Immune function in mice lacking the perforin gene. Proc. Natl. Acad. Sci. USA 91: 10854–10858.
. 2007. Viral targeting of fibroblastic reticular cells contributes to immunosuppression and persistence during chronic infection. Proc. Natl. Acad. Sci. USA 104: 15430–15435.
. 2008. Persistent virus infection inhibits type I interferon production by plasmacytoid dendritic cells to facilitate opportunistic infections. Cell Host Microbe 4: 374–386.
. 2005. Cell type-specific involvement of RIG-I in antiviral response. Immunity 23: 19–28.
. 2010. Unraveling the functions of plasmacytoid dendritic cells during viral infections, autoimmunity, and tolerance. Immunol. Rev. 234: 142–162.
. 2006. CD69 acts downstream of interferon-alpha/beta to inhibit S1P1 and lymphocyte egress from lymphoid organs. Nature 440: 540–544.
. 2010. Prolonged interleukin-2Ralpha expression on virus-specific CD8+ T cells favors terminal-effector differentiation in vivo. Immunity 32: 91–103.
. 2010. Interleukin-2 and inflammation induce distinct transcriptional programs that promote the differentiation of effector cytolytic T cells. Immunity 32: 79–90.
. 2011. Late interleukin-6 escalates T follicular helper cell responses and controls a chronic viral infection. Science 334: 825–829.
. 2007. Differential role of TLR- and RLR-signaling in the immune responses to influenza A virus infection and vaccination. J. Immunol. 179: 4711–4720.
. 2001. Memory CD8+ T cell differentiation: initial antigen encounter triggers a developmental program in naïve cells. Nat. Immunol. 2: 415–422.
. 2002. Estimating the precursor frequency of naive antigen-specific CD8 T cells. J. Exp. Med. 195: 657–664.
. 1998. Identification of Db- and Kb-restricted subdominant cytotoxic T-cell responses in lymphocytic choriomeningitis virus-infected mice. Virology 240: 158–167.
. 2011. Selective utilization of Toll-like receptor and MyD88 signaling in B cells for enhancement of the antiviral germinal center response. Immunity 34: 375–384.
. 2008. Evidence for HIV-associated B cell exhaustion in a dysfunctional memory B cell compartment in HIV-infected viremic individuals. J. Exp. Med. 205: 1797–1805.